Celebrating World Whisky Day, which falls on May 19, means little without a glass of this golden elixir in hand. Good thing for us, there’s no shortage of places with a good variety. Founder Tan Soo San fell in love with whiskies more than 10 years ago, which led him to open this charming 36-seater at Palais Renaissance. It offers a 500-strong collection of hand-picked spirits and whiskies, some of which are so rare and unique you won’t find them in the market anymore. There are no tasting notes here as Tan encourages guests to discover their palates for whiskies. Some of its prized bottles include the Glendronach 12 Year Old, Glenmorangie 10 Year Old and the Isle of Jura 10 Year Old. Need something more to follow? The chatty bartender does have a fine selection of wines on hand, or perhaps a cocktail is in order. Walk along Tanjong Pagar and you will easily spot a bare brick-covered bar with the most impressive display of whiskies spanning well-known regions in Europe and Asia. 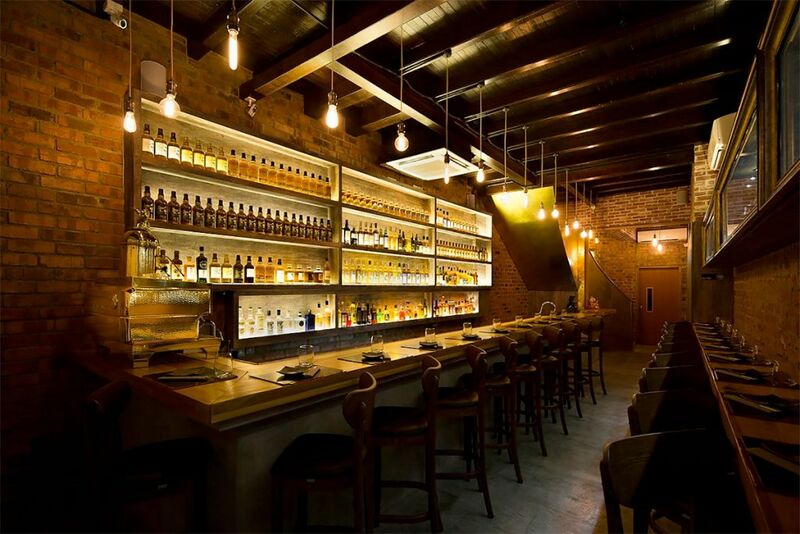 This is two-year old whisky bar The Wall, which prides itself in its exquisite collection of drams. This includes the extremely rare Yamazaki 50 Year Old with only 150 bottles available worldwide, the Black Bowmore 29 Years 1st edition with only five casks created, and The Macallan 1948 Select Reserve 51 Year Old where only 366 bottles are available. You’re encouraged to discover what you like via a tasting flight designed to introduce you to the whisky's different flavours—from the fruity, herbaceous to more potent alternatives. Best of all, the bar has a full sumiyaki menu that can be had with the drinks. Its intimate and simple setting ensures you get the full experience of a whisky tasting, which is often led by co-founder and chief sommelier Daisuke Kawaii. He has over 20 years of experience under his belt, enabling him to curate a stellar list of more than 1,000 wines and whiskies. Guests are welcome to explore the whisky menu, which is regularly updated as some have limited stocks while others are exclusive to the bar. There’s a handful of Japanese whiskies available—Yamazaki, Hakushu and Nikka, to name a few. But the Scottish whiskies are still the pride of place, with bottles including the White Bowmore 1964, 43 Years, and the Linkwood Rare Malt Selections 26 Years 1975. This whisky bar by husband-and-wife team Chua Khoon Hui and Joyce Ng nails the first impression with a sprawling, illuminated wall adorned with over 800 popular, vintage and rare whiskies—some from lesser known boutique distilleries. Newbies are encouraged to go for its themed tasting sets, aimed at exposing guests to the drink’s different tastes and flavour nuances. Exciting options include the Bunnahabhain 12 Year Old and the Tomintoul 12 Year Old. For the seasoned whisky drinker, the Springbank 16 Year Old Local Barley and the Glenglassaugh 40 Years Old Vintage served in gentleman’s pours await.